From the first moment you visit William Penn, you’ll see that our community really is a microcosm of the world. 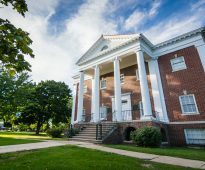 Our campus in Oskaloosa, Iowa, blends historic charm and beauty with cutting-edge technology and is home to teachers and learners representing all walks of life from across the globe. It’s a place where opportunity truly is around every corner. 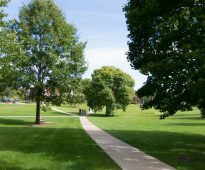 Situated in Mahaska County in the south eastern part of Iowa, Oskaloosa offers small-town charm and world-class opportunities. 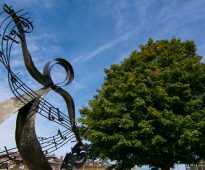 You’ll enjoy the small community feel, with seasonal celebrations throughout the year and a beautiful town square. You can take advantage of two golf courses, two nearby lakes, a bike trail, performances at George Daily Auditorium and other recreational opportunities. We’re just an hour’s drive from the capital city of Des Moines, with a population of around 600,000 and an abundance of academic, professional, cultural, and recreational opportunities. For more information about Oskaloosa, visit the City of Oskaloosa and Oskaloosa Area Chamber and Development Group. Our metropolitan campus is located in Johnston, Iowa—a suburb of West Des Moines—and features programs designed specifically for adults looking to advance or change their careers. 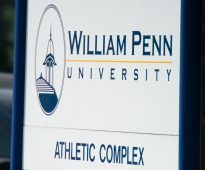 Your visit to William Penn will be an ideal opportunity to sense our energy, explore our beautiful campus, and engage with our welcoming and supportive community. If there’s one word that characterizes our people, it’s genuine. While our campus and facilities are impressive, it’s our people who make us what we are. And they’re waiting to welcome you.